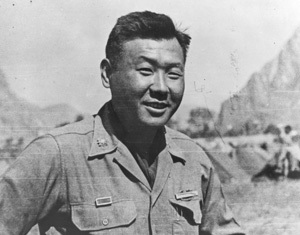 Between 1942-1945, Mitsuyoshi “Mits” Fukuda rose from First Lieutenant, leading a platoon of soldiers, to the field rank of Major, commanding officer of the 100th Infantry Battalion. 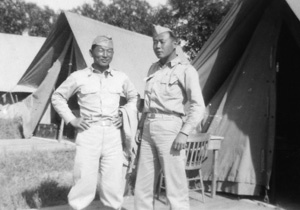 He was the first Nisei to ever attain this position in the U.S. Army. Mits Fukuda was born January 15, 1917, in Waialua, Oahu, where his father, Kunizo, worked as a carpenter at the Waialua Sugar Company. When Fukuda was three years old, sugar workers went on strike for higher wages and when the strike failed, his family was expelled from the plantation. One of Fukuda’s earliest memories was walking behind his father and mother, who had his baby sister slung behind her back as they hitch-hiked to Honolulu — almost 30 miles away. Kunizo found work at a lumber company and grew vegetables and flowers on the side. Unable to speak English, but with ambitions for his children, he told his son he wanted him to go to the University of Hawaii. Fukuda attended the UH College of Agriculture after graduation from high school. However, during his sophomore year, his father died in an industrial accident and the family struggled. To help his family, Fukuda enrolled fulltime in ROTC, which provided him with a tuition stipend. Unfortunately, after graduating from the UH in 1939, Fukuda found that management jobs in agriculture weren’t available for Japanese in Hawaii. Determined to find a white-collar job in something, he switched to teaching and obtained a degree in vocational agriculture in 1940. This led to a job as a teacher in Kona in 1940. After the attack on Pearl Harbor, Fukuda, like all ROTC graduates in the Hawaii National Guard, was called up for military service. He was assigned to guard the Hilo Airport. In May 1942, he and all other Japanese members of the 298th and 299th Infantry Regiments assembled at Schofield Barracks where they were made members of the newly formed segregated Japanese unit: the Hawaii Provisional Infantry Battalion, later designated as the 100th infantry Battalion. He was promoted to First Lieutenant and a month later on June 5, 1942 left Hawaii for Camp McCoy, Wisconsin. It was Fukuda’s first voyage away from the islands and years later he would recall his initial shock at seeing white laborers working on the Oakland, California waterfront. After living his entire life in racially stratified Hawaii, it suddenly occurred to him that the entrenched employment discrimination he knew in Hawaii was not universal. Fukuda was determined to advance himself and his organizational talents were quickly recognized. By the time he and his fellow soldiers finished training and left for Europe in 1943, Fukuda was a platoon leader. In Italy, January 1944, Fukuda was promoted to Captain. While leading an assault on Hill 1109, a mountain top near Mount Cassino, he suddenly found himself and his platoon trapped by enemy fire and unable to retreat. He ordered his men to dig in where they were and ran alone back up the hill zigzagging his way up through the snow, dodging bullets until he was able to get to the top and reach help. Two weeks later, at the Battle of Monte Cassino, Fukuda crossed a muddy minefield four times while under heavy enemy mortar and machine gun fire. By the time the men were withdrawn from the battle at the beginning of February 1944, they had taken so many casualties that of the 832 men who went into the line in January only 521 were still left, all that remained from approximately 1,300 members of the 100th Battalion which had landed in Salerno, only five months before. However, Fukuda would never be wounded, although he was repeatedly exposed to heavy fighting and had many close calls. “I learned how to keep my head down,” was Fukuda’s simple explanation of his good fortune.